The wonderful sunshine we’ve been having the past few days and exciting natural phenomenon like Sun-Still-Up-at-5:30 p.m, have got me itching to grow things. It’s still a little early to plant seeds here (though I’m sorely tempted), so I’ve been goofing around with my kitchen window plants. Check out the little basil plant above. 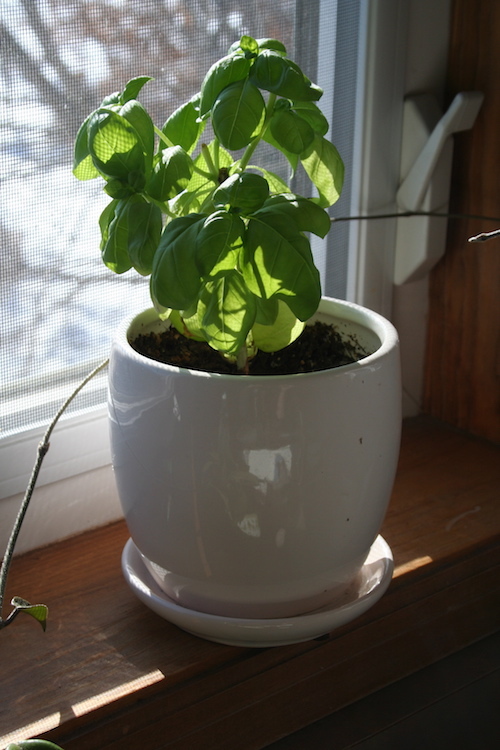 Somehow, despite meager light, I’ve managed to winter over two basil plants from last summer. I started these from seed later in the year, so they never reached maturity outdoors, and I’ve gotten an occasional leaf off of them to flavor a stew or salad. Mostly I keep them going because they remind me of summer. 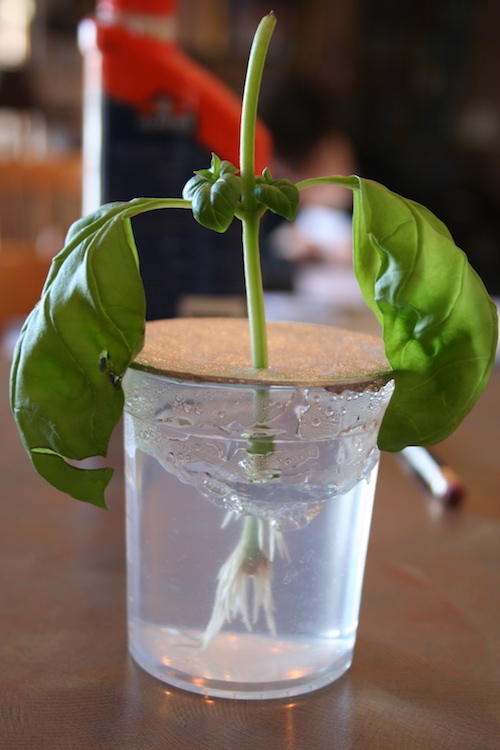 The Basil rooted easily in the gel pack. A couple of weeks ago, while visiting my local big box for some lumber, I saw these gel packs in the garden section. You stick a cutting in the gel and wait for new roots to develop. I suspect this is usually used for houseplants, but what the heck. I cut a bit off one of the basils and stuck it in the gel. About a week later, these little leaves emerged, then roots! I plan to plant all three of the basils outdoors come May but for now, I’m enjoying the wonder of watching something — anything — grow! I just found your delightful blog and happy to have done so. Start a basil cutting? Wow! Although I would love to try one of the gel packs, I’m elbow deep in seed starting mix and tiny heads of radish, mesclun, cabbage, sugar snap peas… are poking through.